Protecting your rights as a Mod Author! So, there's been an ever-increasing trend of server owners monetising the mods they have installed on their server as a means of microtransactions. This essentially means that server owners are blocking access to either parts of mods or completely with the intent of making money from the works of mod authors. While they can be doing this to offset the cost of server renting, without the permission of a mod author, it still does not justify it and it is a serious breach of rights. Creative Commons has created a licence that can help with this issue. The Attribution Non-Commercial and No Derivatives (4.0) license covers you in the best case. This licence also protects you from other mod developers that you have shared your code with, where they have implemented that code directly into their mod, and are using it without your permission, for monetary gain or otherwise should you wish to take action. A quick and basic thing you can do to give yourself the legal backing required to be able to prevent such things from occurring is adding a Creative Commons NonCommercial-NoDerivatives licence declaration on your Steam Workshop page. This mod/code/work is protected by the [URL=http://creativecommons.org/licenses/by-nc-nd/4.0/legalcode]Attribution-NonCommercial-NoDerivatives 4.0 International Creative Commons License. ~ If it is not yours, and the Author has attributed this licence to their Mod, you should notify the Author of the infringement. The Steam Workshop page will probably be the fastest route otherwise, if they allow it, a personal message or comment on their profile should get their attention. ~ Gather evidence of the infringement. This could be screenshots of either the website(if they have one), in-game instructions and offers or some other means of engaging in the infringement showing the mod feature/access being advertised as "for a price" or "comes with a 'donation'". ~ Document the Server IP AND Port Number. Several servers run out of the same IP, so the Port number is important. It may even be best to screenshot the arkservers.net page of the server, showing the active players as well. This may help if needing to prove the server had a chance to make a profit off of other players. ~ If a website exists and is involved in the infringement(offering/advertising mods for "sale"), document the URL of the website and use whois.net to obtain the hosting provider for their domain and the hosts contact information. ~ Try and get some sort of contact information for the server owner/operator. If you have their contact information, send them a DMCA Takedown Notice. If you have obtained the website host information, send the Notice to the Host of the website, this in turn requires the host to forward the notice to the owner and act on the notice should the infringer not comply in a reasonable period of time as it helps remind them how to avoid legal liability in the event of any Copyright claims that could proceed to lawsuits. DMCA Takedown template is attached(as .docx and .txt files (in a .zip due to file size limits) - also in the code box below to cover all bases for people to access it), tweaked to reflect the nature of this a litte more accurately, replace all of the capitalised/bolded text - you only need to provide one formal means of communication however(most commonly a valid email), also it would help to use your real name and provide your Steam moniker(name) to associate yourself with the mod(s) in question more clearly. If you wish to send the notice directly to the owner/operator then the notice should be altered further as the template is directed towards hosting providers. Furthermore, if the infringer has made available a PayPal address/button for people to send money to, you can also contact PayPal with an infringement report(as this is less to do with content and more specifically the money side of it, a DMCA notice will not work here) and they have their own policy for this. You can find their template/form at this link - you can also right-click and 'Save As...' as it's a PDF file. The PDF has form features built in so you can fill out the required information(note: this one will require information such as your name, address, etc. as it's a much more "official" means of reporting infringements) and once done so, you're instructed to either fax or email the completed form to infringementreport@paypal.com. This is a notice in accordance with the Digital Millennium Copyright Act of 1998 (DMCA) requesting that you immediately cease to provide access to the copyrighted material. I wish to report an instance of Copyright Infringement, whereby the infringing material appears on a website for which you are the host (according to WHOIS information). URL TO PAGE WHERE INFRINGEMENT HAS OCCURRED. My name is INSERT NAME and I am the author and copyright holder of the works described below. The party involved in the infringement is violating the Creative Commons Attribution-NonCommercial-NoDerivatives 4.0 International License by monetizing the original works without authorization. I am providing this notice in good faith and with the reasonable belief that rights I own are being infringed. Under penalty of perjury I certify that the information contained in the notification is both true and accurate, and that I am the copyright holder of the works involved. Last edited by WoefulMacabre; 03-17-2016, 04:30 PM. Reason: Added information regarding reporting infringements to PayPal. Here is the offending site/server that initially brought all of this about. Ertosi's Chute skins are currently being offered for a price. You guys should keep an eye on this site for yourselves to make sure your mod's don't end up here in this situation. DMCA Violation notices have already been sent out. Along with Apple being contacted for the site using their logo illegally. PayPal Infringement notice has been sent as well on behalf of ORP. Ivam from Metal & Glass mod has been notified of his mod being used here as well for sale. Last edited by jslay; 03-17-2016, 05:05 PM. Bumping to keep this up and visible. To give an update the situation Jslay and I were facing, they did finally remove all of the offending material, but it wasn't until we commented to one of their advertising sites where their admin and players frequently posted. At first they were rather indignant about the situation but once we explained that selling something created by another was most certainly a form of theft they apologized and were actually quite polite about it. They quickly removed our mods from their donation advertisements, even removing the Glass Metal mod references before asked to do so by its mod author (as only the owner of infringed upon works has the right to request a take down). I thanked them for setting things right and for me the matter is closed. But we as a community should certainly stay vigilant to behavior like that and let each other know when it arises. Personally, I think server owners should be able to provide services to donators, with services being defined purely as actions one would need to be an admin to do such as custom-coloring dinosaurs. Once you start selling items, even vanilla ones, it starts to get iffy. The ARK Dev team owns the intellectual property of everything in ARK, so only they can say if such behavior is ok or not. When modded works start getting sold, it adds another layer as the ARK Dev team owns the original material and we modders also own the derivative works. 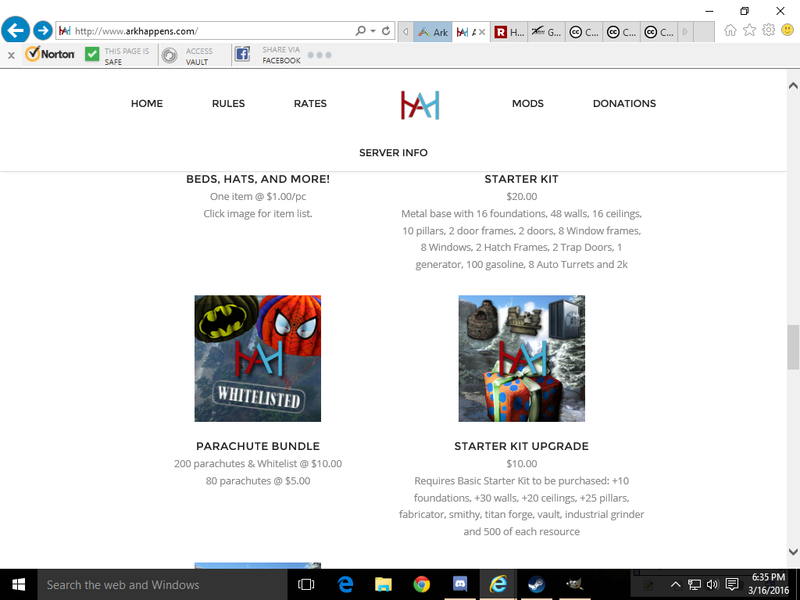 The site that had infringed upon Jslay and myself had very specifically listed our mods, including links to our Workshop pages. Heck, they even photoshopped out my Skull Island and Fandom Fineries logos and added their own server logo over my items. That combined with selling individual items from my mod for a buck each or bundles of my parachutes for $10, it was certainly a clear violation that required response. The site spezz lists above is certainly referencing modded material, but its not specifically naming the mods in question, nor is it showing art created by said mod owners. Is it ok? That's up to the ARK Devs and mod owners of the listed items (dragon saddles and armor as well as photon cannons and rifles). Last edited by Ertosi; 03-19-2016, 10:35 PM. The Ark Dev has already spoken about monetizing on the Ark content. Both TheRightHand and Drake has commented on that thread. However, custom mod content is another story. My Servers - I have many servers running. Main server below. I have no issues with servers accepting donations and turning their server into a pay 2 win if they want. I also have no issue with a mod dev creating a mod specifically for donations, or creating a mod just for their server to help promote donations. What I do have a problem with, is the clear violation of creators rights concerning mods. 99.9% of these problems are solved just by contacting the mod dev first. Even if the mod item is completely available to learn for everyone on the server, the fact that you can buy that mod item to help support the server is the same thing in my opinion too, and without the permission of the mod developer, I still see this as a violation of the creators rights. 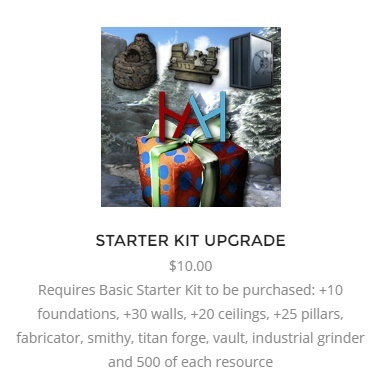 ArkHappens is still selling industrial grinder, and whatever titan forge is. I have tried adding the mod dev of industrial grinder to my steam friends to notify, but have yet to receive a response. Bump for the sake of bumping. Ok, no more bumping.. It's now a part of sticky nation! This was a really good read and great information. Thanks woeful for posting this, i appriciate it! What about other mod authors who are using custom work from your mod? What recourse is there with this? This was actually answered else where by a helpful admin. Steam has a DMCA take down page for those unaware. Last edited by Encryption767; 05-17-2016, 11:04 PM. this cant be done... people keep thinking "oh that is my idea and works teh same as mine... THEY STOLE IT!!!!". Wrong answer. When you cook the mod we cant add it to our dev kit, it wont open. i cant download your mod and steal your assets. While this may be true for compiled assets that are put into a binary format for run time speed, this doesn't apply to textures. You can view them in the devkit and even export them no problem by moving the cooked mods folder over to the devkit's mod dev folder. Binary assets will crash the devkit but textures will not.